I feel thankful as I write this blog post after a morning walk to school with my children. The end of last week was rainy as was the beginning of this week. Today the sun was out and the sky was bright blue. The air had the perfect touch of cool. Dew sparkled on the grass which prompted my son to ask me how it forms. The white puffs on the dandelions looked sticky from the moisture. We thought, I guess we will have to wait to blow them. A group of rabbits darted under a bush. They were fast but we still saw their puff tails. We leave twenty minutes earlier when we decide to walk to school. Despite having less time to get ready there seems to be less stress for everyone on these days. Less stress is something to be thankful about. Slowly walking with my children is something to be thankful about. 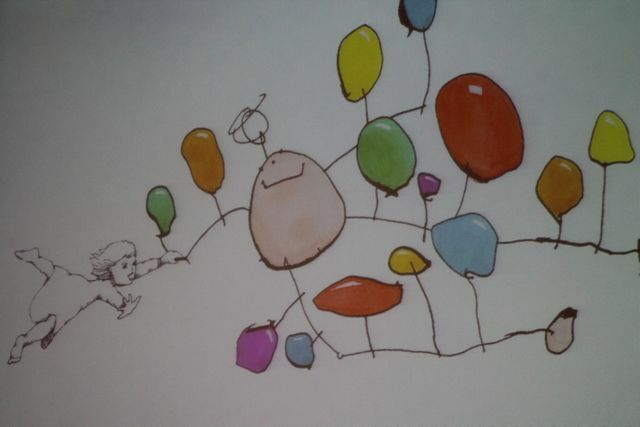 Celebrating another author birthday with my family is something to be thankful about too. Deborah Freedman is the author and illustrator of four, soon to be five, picture books including The Story of Fish and Snail and By Mouse and Frog. A daily walk is part of Deborah's routine. 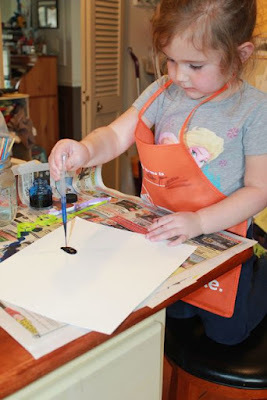 She said, "The rhythm of walking helps with picture books." 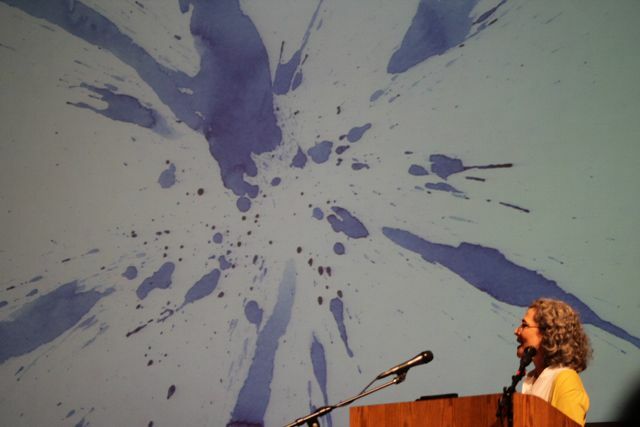 (Mazza Museum Keynote.) Another thing that helps is growing up with a strong family connection to field of children's literature. Deborah's aunt and uncle, Mary Ann and Norman Hoberman, created picture books together in the late 1950s and early 1960s. 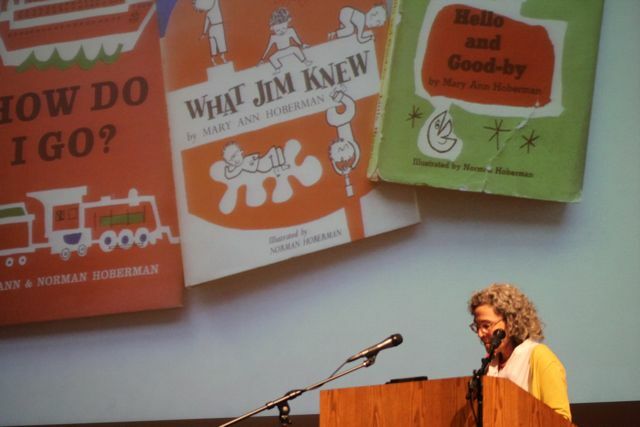 Mary Ann Hoberman went on to become a Children's Poet Laureate and an author of over 30 books. At the Mazza Museum Deborah described their influence, "Their books are a part of me now, part of my wiring." Deborah attended Yale University to study art history and then went to Harvard Graduate School of Design to study architecture. She worked as an architect but started to play with books when her daughters were very young. She often made tiny, personal hardcover books for them and when they were older the books contained funny things her daughters said. Deborah's daughters loved to draw too and when they got a little bit older they would tell stories about their drawings. 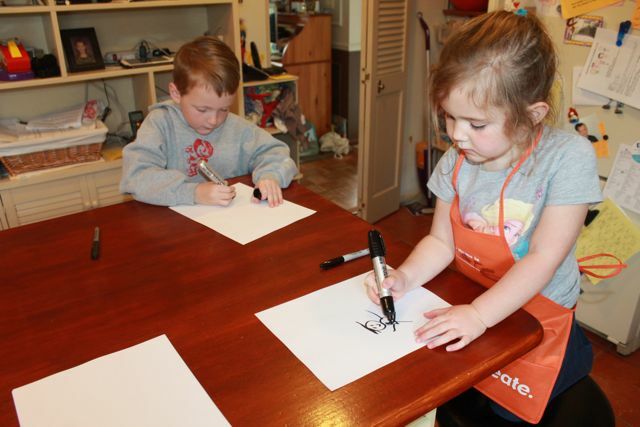 This gave Deborah an idea, "What if I wrote a story about two sisters who loved to draw and the story behind their drawings? 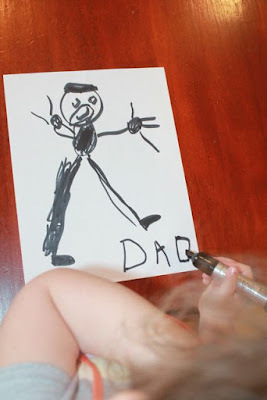 When they [my daughters] were really little I took their drawings and photocopied them and doodled around them and tried to make a book out of their actual drawings (see photo below), but...after playing with that for a couple of years actually it was limiting me. I realized I had to do the 'kids' drawings myself." (Classroom Connections). 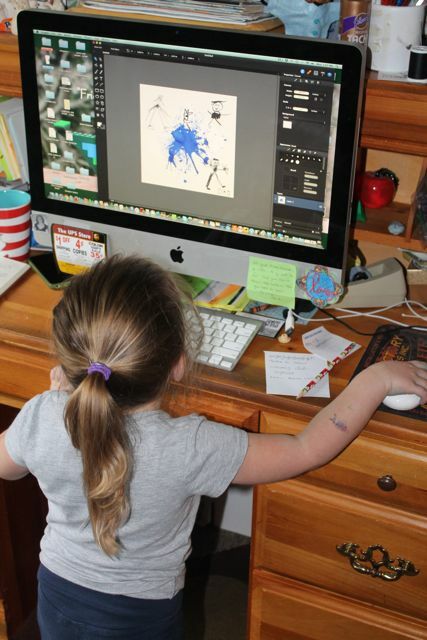 All of this led to her first picture book, Scribble in 2007. 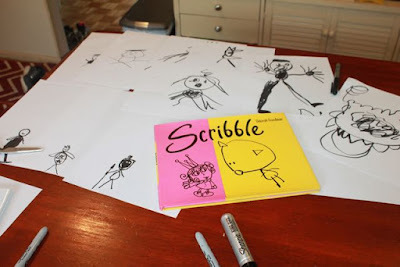 Scribble is a story about two sisters whose drawings lead to fight, a black scribble, a story of a princess and a kitty, and a happy ending. 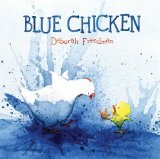 Blue Chicken was Deborah Freedman's second book and was the inspiration for our birthday celebration activity. This book starts with an almost finished painting on an artist's desk. The only thing left to paint is the sky and the barn. 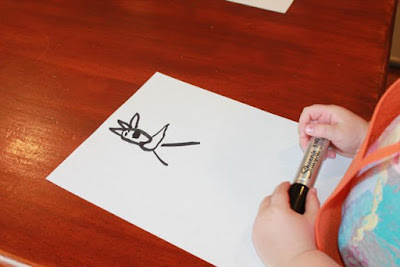 While the artist is away, the painting comes alive with a white chicken spying the artist's watercolor paints on the desk nearby. The chicken wants to help finish the painting, but the paint spills! The white chicken is no longer white, but BLUE! 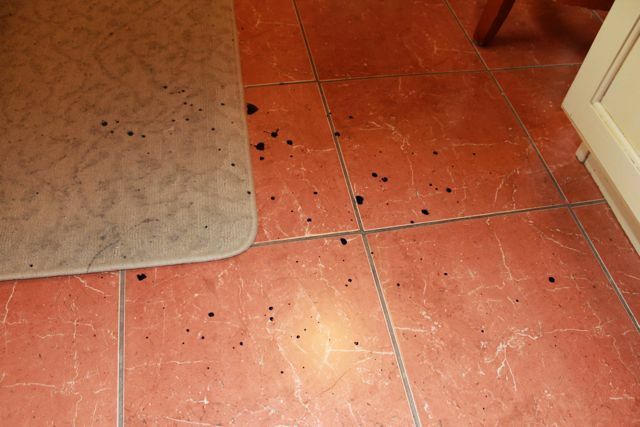 Paint splatters everywhere and the other animals are unable to avoid it. Blue chicken must figure out a way to clean up the mess and maybe, just maybe, his solution will also help with painting. 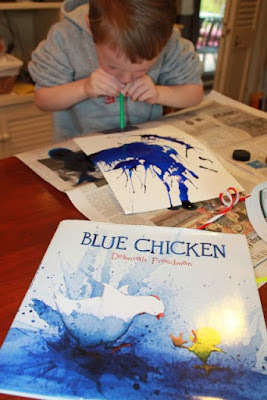 Deborah told the audience at the Mazza Museum that she used a straw to blow paint to make some of the illustrations for Blue Chicken. The splatters and splashes were scanned and combined with separate drawings of the farm animals. She described this as "controlled chaos" as she didn't want to ruin her drawings if the paint didn't splash the right way. I had to try this! 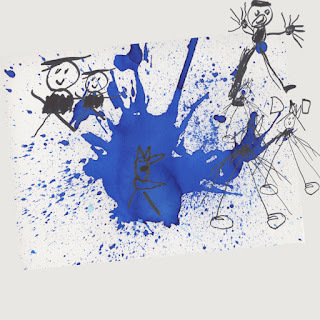 I wondered if we could combine Scribble and Blue Chicken into an afternoon of messy fun! 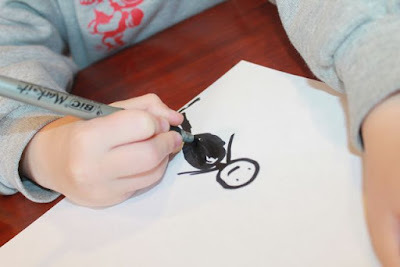 We started with Scribble drawings with black markers. 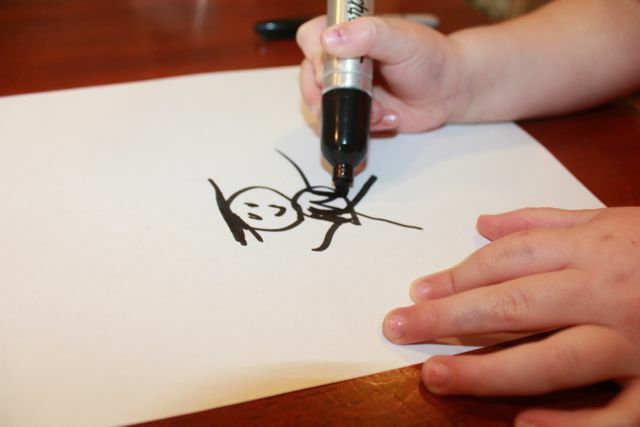 After my daughter finished a drawing of a princess and while her brother was drawing a knight she asked if she could draw one more thing. I am glad she did. All the drawings were complete. 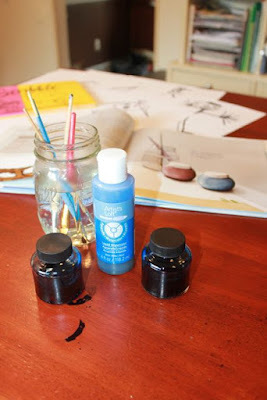 I bought blue liquid watercolor paint and two small glass jars at Michael's craft store. 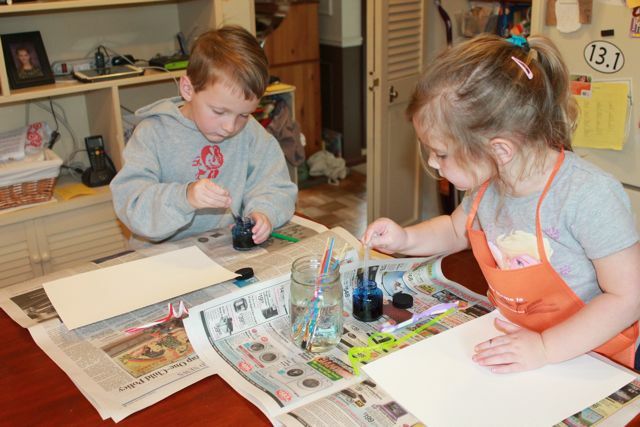 I filled the jars with the paint. 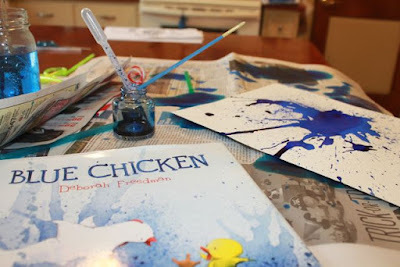 Deborah Freedman also used pipettes to squirt paint, toothbrushes to make fine splatters, and paintbrushes for bigger splotches for the illustrations in Blue Chicken. (Classroom Connections). 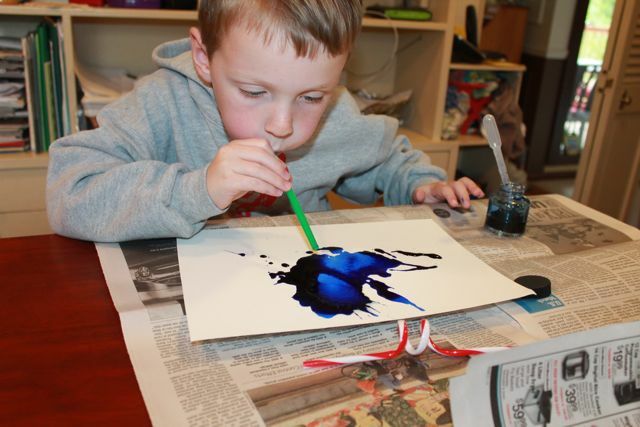 I had all of these tools plus many pieces of heavy watercolor paper for my children to create their art. I found small plastic pipettes in a science kit we had in the basement. It was their favorite tool they used during this project. After squirting on the blue paint they used the straw to blow the paint around. Make sure you put down newspaper because the paint will go everywhere. My daughter was having so much fun! 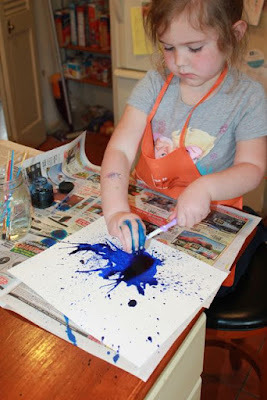 The mess was contained until she started experimenting with flicking paint with a toothbrush. 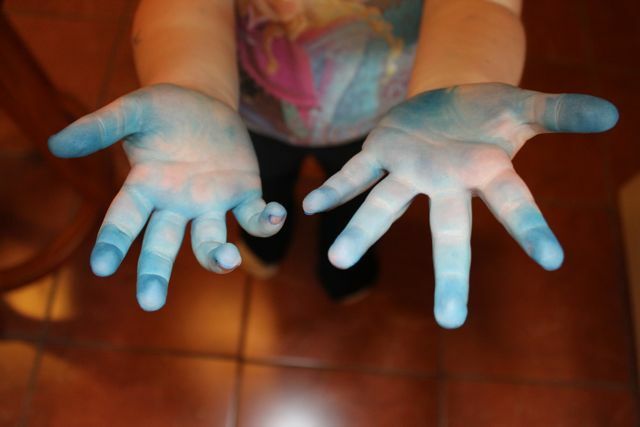 Her art looked awesome on the paper but her hands were bright blue. We joked, You are starting to turn into a blue chicken. 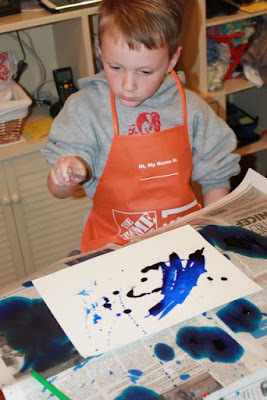 My son really liked flicking the paint with a paintbrush. 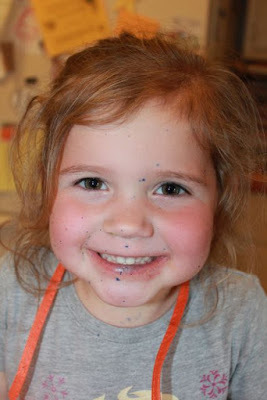 She flicked paint on her face! We had some messy fun with Blue Chicken. Do you follow Happy Birthday Author on Pinterest? Please pin! 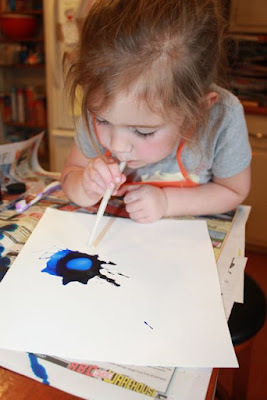 Instead of blowing the paint, she sucked in! 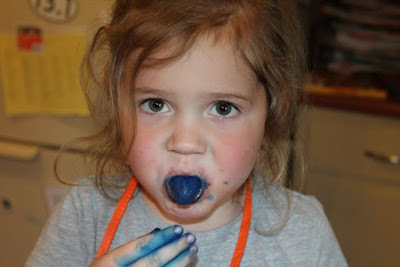 She really turned blue like Chicken! 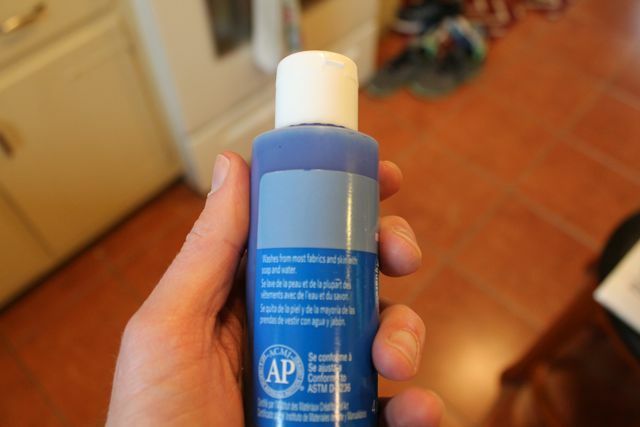 The bottle did say, "washes out with soap and water." Later, by the time she had her nighttime bath she was back to being a white chicken. I scanned all their Scribble drawings and their favorite blue splotch painting. 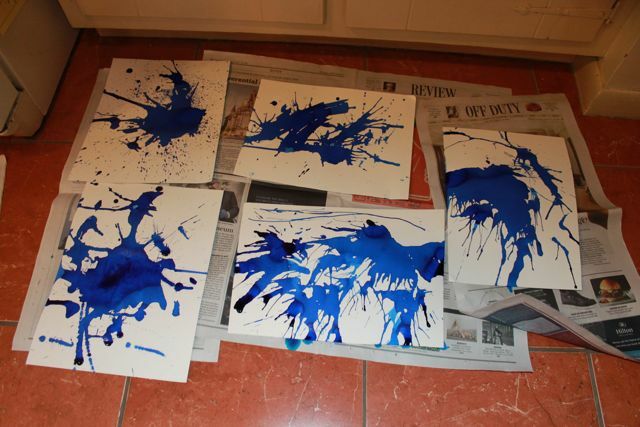 Then, we put everything together into one piece of art. Do you see the blue chicken in middle of the paint? 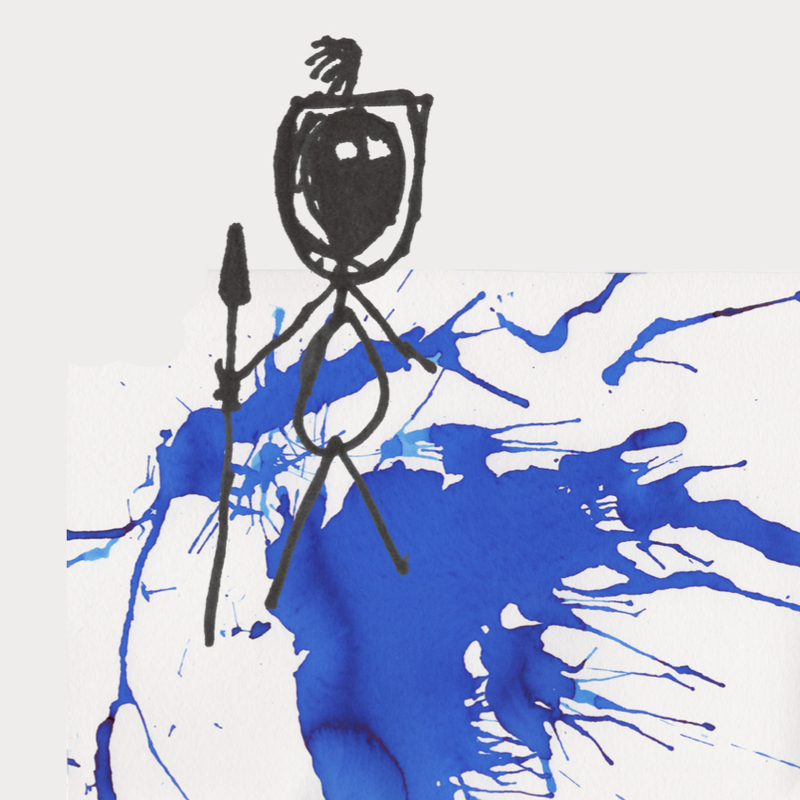 My son's knight stood with his spear in the middle of the blue paint splatter. Deborah, thank you for sharing your birthday with me at the Mazza Museum. We hope you have a wonderful birthday and wish for sunshine during your daily walk!